Speaker is our own Kalil Boghdan, Orvis guide. Kalil says he is far from being an expert freshwater fly angler and that he learns something new each time he is on the water. 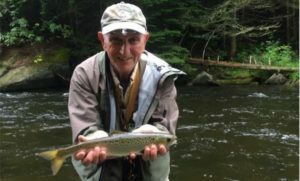 This evening, Kalil will speak on his experiences fly-fishing the Upper Connecticut River in Pittsburg, NH and his stay at Lopstick Lodge.